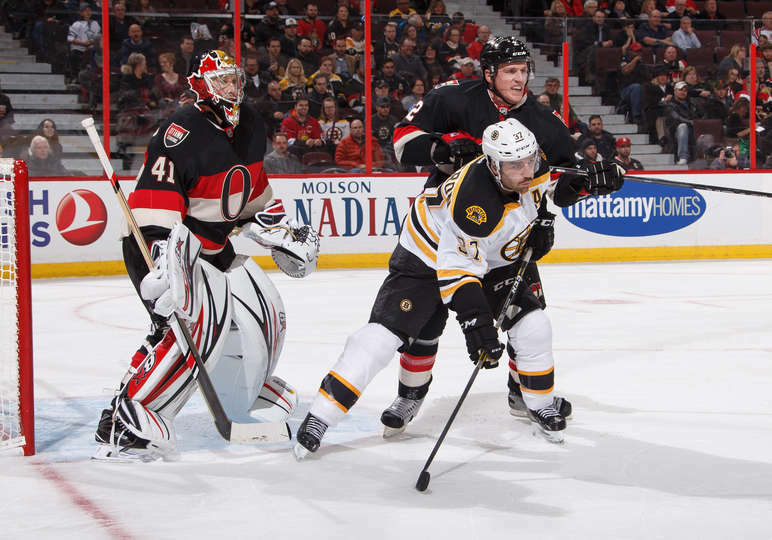 OTTAWA — The Ottawa Senators rallied with three unanswered goals for a 3-1 win against the Boston Bruins at Canadian Tire Centre on Thursday. Mark Stone, Chris Wideman and Kyle Turris scored for the Senators (12-7-1), who have back-to-back wins. Craig Anderson made 19 saves. David Pastrnak scored for the Bruins (11-9-0) and Tuukka Rask made 23 saves. The loss was Boston’s second in a row and third in the past four games. Wideman gave the Senators a 2-1 lead at 6:28 of the third period when his shot from the right point deflected off Bruins forward Dominic Moore in front of the net and went in on the stick side. Bruins defenseman Torey Krug cleared the puck onto Wideman’s stick to start the play. Turris scored his team-leading ninth goal at 10:16 of the third to give the Senators a 3-1 lead, finishing off a nice passing play with Stone. Stone tied the game 1-1 at 13:23 of the second period when he took a pass from Mike Hoffman at the Boston blue line and broke in on Rask. Stone faked to his backhand and then cut across the net and scored his fifth goal of the season. Back in the lineup after missing three games with an upper-body injury, Pastrnak made it 1-0 on the power play with 10.1 seconds left in the first period. With Senators forward Chris Neil in the penalty box for interference, the Bruins created traffic to Anderson’s left and a shot by Brad Marchand got caught up in the cluster of players. Matt Beleskey was first to it when it fell to the ice and he put it in front where Pastrnak was alone. He missed his forehand shot, but recovered to bank a backhand shot off Anderson. It was Pastrnak’s 11th goal of the season.